Every garnet ring on this page has a design that has been researched by our team. It does not matter whether you choose a gold or silver garnet ring, as we provide good craftsmanship for both gold and silver garnet rings. Every garnet ring uses a gemstone that has been handpicked and closely inspected by our gem stone experts. Your garnet ring will not have a low grade, gemstone and we do not indulge in close out and blow gimmicks. These are genuine custom garnet rings made by some of the world's finest craftsmen. We would like to let you know that all our jewelry can be made in 14k or 18k white or yellow gold with gemstones of your choice. You can infact send us images of your favourite designs to be custom made by us. This means that you are not restricted to a limited set of designs when ordering your garnet ring from us. All jewels on our website can be made with gemstones of your choice, you can therefore order any ring design as a garnet ring. You can order any of these garnet rings as a gold or sterling silver ring and rest assured that, you will get an excellent high end garnet ring. Surely the cutest garnet ring that you will ever find. This cat garnet gemstone ring is custom made in gold or sterling silver with a gemstone of your choice. It is quite rare to find a cat ring that fully depicts the cat, most rings give emphasis only to the face of the cat. 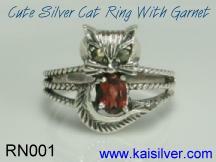 This cat garnet ring is based on an antique cat ring design and shows the entire animal on the ring. Since this is a true custom garnet ring, all ring sizes are available and you have the metal options for silver and gold. The garnet is the January birthstone and you can order this cute garnet ring as a birth stone ring for yourself or someone you love. If you are on a budget, order a sterling silver cat garnet gemstone ring. For complete details click here . This is an excellent garnet ring with a gorgeous center garnet gemstone. The excellent gold weight of this garnet ring ensures that the center gemstone and side diamonds are firmly mounted. The design is suitable for an engagement garnet ring or a diamond garnet wedding ring. You could also order this as a garnet band ring by requesting for the band to have a regular band width throughout. Since this is a made to order garnet ring, the design can be modified to include a larger garnet gemstone or exclude the diamonds from the ring. The image shows a white gold garnet ring with diamonds, you can order this ring as a yellow gold ring too, sterling silver is also available as an option. For complete details click here . 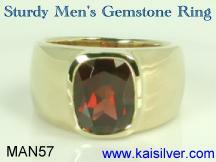 The MAN57 is an awesome birthstone garnet ring for men. The ring has a large center garnet gemstone of size 11mmx9mm, this is a handpicked and custom cut red garnet gemstone. 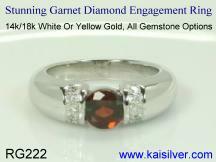 This garnet ring is fully custom made and can be ordered with a tapering or uniform band width. The excellent weight of this custom garnet gem stone ring ensures that the ring retains shape and keeps the center gemstone firmly mounted. The ring is also suitable for a men's gemstone wedding band with garnet or any other gemstone. 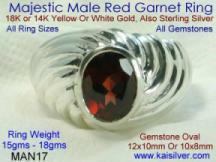 You can order a yellow or white gold men's birth stone garnet ring, and we provide the option for 14k or 18k gold. Your garnet ring is custom made in all ring sizes. For complete details click here . If you are looking for a classic garnet ring with meaning and significance, the RG173 garnet ring should be your first choice. The Claddag ring has a 300 year history and is surely history's most meaningful jewels. The first Claddag ring is believed to have been made more than 300 years ago by an Irish slave named Robert Joyce. This garnet ring with a heart shaped gem stone would make a terrific valentine's jewel. 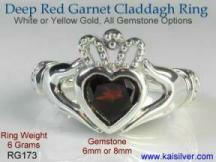 The ring signifies love, friendship and loyalty and is therefore suitable for an engagement garnet ring too. Kaisilver creates the world's best rendition of the Irish Claddag ring in gold and silver, that retains all the meaning and features of the first ring made more than 300 years ago. For complete details click here . The HSR02 is a stunning antique style sterling silver garnet ring, each ring is fully custom made and extremely skilled craftsmen work on each jewel. No effort has been spared to create this gorgeous antique garnet gem stone ring. The center oval shaped garnet is firmly set by bordering the entire garnet gem stone with metal. The glitter on this custom garnet ring comes from the small round white sapphires around the center stone. The gemstone in the HSR02 garnet ring is handpicked and custom cut by our experts. This classic old style garnet ring looks better in sterling silver rather than gold, you can however order a sterling silver or gold custom garnet gemstone ring. For complete details click here . The MAN25 garnet ring is suitable for both men and ladies, the ring has a good quality red garnet gem stone in the center, genuine square diamonds are set on either side of the band. The lady's version of this garnet ring would have a smaller gemstone as compared to the men's garnet gem stone ring. It is not easy to find good quality men's engagement garnet diamond rings, so if you are looking for one, grab this ring. The garnet is a gemstone that looks awesome in yellow or white gold, so your ring would look stunning as a yellow or white gold garnet ring. Your garnet ring can be ordered in all ring sizes and this is true of all our custom rings, all design changes are possible. For complete details click here . The HSR01 antique silver garnet ring has a good metal weight and this is how it would have been made in the old days. Notice the artistic design on the sides of this custom garnet ring. While retaining the antique style, we have provided fine craftsmanship and ensured that you get a true high end garnet ring. The design of this garnet ring is ideally suited for ladies, but the design can be modified slightly and made suitable for a men's garnet gem stone ring too. If you needed to have this design as a male garnet ring, just leave out the artistic curves on the sides of the band. You could consider ordering this antique garnet design in yellow or white gold instead of sterling silver. For complete details click here . The MAN27 garnet ring is a classic example of a gent's garnet ring with a large garnet gem stone in the center. The ring has a masculine design with ripples on the metal band, the center garnet gemstone is a 14mmx10mm red garnet. The large center gemstone gives the ring a big head height and is suitable for people who love big gem stone rings. Surrounding the center gemstone of this garnet ring are genuine custom cut white sapphires. If your budget permits, you could consider replacing the white sapphires in your custom garnet ring with genuine diamonds. 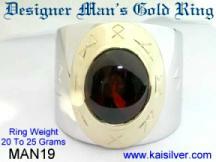 The MAN27 garnet ring can be ordered in silver or gold, both options have good weight and craftsmanship. For complete details click here . This is an ideal men's garnet ring for those who prefer medium sized rings. The center gemstone is a 9mmx7mm oval red garnet gemstone and it is firmly set in a sturdy silver or gold mounting. Like most of our garnet gemstone rings, prong setting for the gemstone has been avoided. There is a texture on the band of this ring but you can order your ring as a plain ring without any texture too. The garnet gemstone is custom cut by some of our finest gemstone cutters. You can consider a design modification for this garnet ring by setting a round gemstone instead of an oval stone. 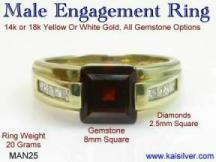 The gold and silver garnet gem stone ring are reasonably priced because of the modest dimensions. For complete details click here . 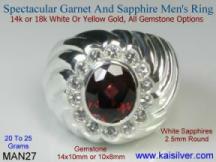 A stupendous gents garnet ring, the MAN19 image shows a high end two tone garnet ring for men. The straight drop design of the band of this garnet ring is ornated with a symbol on either side of the band. The center has a smooth cabachon cut garnet gem stone firmly mounted in a yellow gold rim. The artistically etched symbols with special meaning are optional and you can also leave them out completely. Your two tone custom garnet ring can also be ordered in a single gold color. If you like the design of this gents garnet ring but are not impressed by it's large (head) height, we can custom make a shorter version of this custom men's garnet gemstone ring for you. For complete details click here . With direct and preferential access to prominent gemstone resources in 5 nations, we work with a gigantic gemstone base of over 200 million carats of gemstones. Every gemstone is handpicked and custom cut by our experts and we do not indulge in gimmicks like 'close outs' and 'blow outs' where, low grade gems are loosely mounted in flimsy lightweight gold settings. We do not indulge in sales gimmicks where low grade jewels are hyped in flashy catalogs and displayed in big department stores. We custom make high end jewels with good gold weight and good craftsmanship. Our clients are genuine jewelry lovers and appreciate the high quality service and merchandise that they receive. We rely solely on satisfied buyers to grow and have never succumbed to the temptation of pleasing mass markets by peddling cheap light weight junk jewelry. When you shop at our website, you will be surprised at the comfortable pace at which we allow you to proceed to finalise the order. There is no high pitched sales talk and emphasis is put on guidance rather than order confirmation or profit margins. You are not presented with a standard catalog to make your choice from and each jewel is personalized to your needs, budget and specifications. When you have a query or doubt, you get honest and straightforward answers from real jewelry experts who are real humans and very keen to clear your queries. 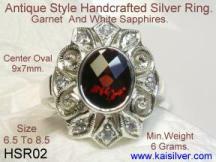 If you have any queries or doubts please email us at sales@kaisilver.com and we will be glad to answer all your doubts. It does not matter whether the final order comes to us or not. This is the way that we prefer to do business as it helps us bring back the human touch to online selling. In most cases, your bank would also help you with Western Union Money Transfers. Do let us know if you prefer Western Union as a mode of payment and we will provide you with details for the same. If you choose Western Union Money Transfer, our staff will let you know of any special offers that we have open at that point of time for payments received through Western Union Money Transfers. It is perhaps the classic red color and the moderate price of garnet gemstones that has made garnet rings very popular. When you order a garnet ring, make sure that you get an eye clean gemstone with good cutting. If you are looking for a men's garnet ring, the gemstone could be quite large with a weight of around 3-5 carats. It is not very easy to find a good quality and eye clean garnet gemstone of this size. However, a good jeweller with access to large gemstone inventories would not have a problem finding one. It is therefore important to evaluate and select the right jeweller to buy your garnet gem stone ring from. A good quality red garnet would be red and not brown, this will be true no matter how dark and deep the color is. Keep this in mind before finalising the purchase of your garnet ring. Another useful tip is that, garnets look amazing in antique style jewelry designs. 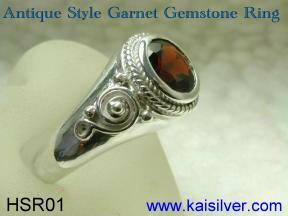 Use this to your advantage and go for an antique style garnet ring in sterling silver. An antique silver garnet ring design would not be as expensive as a gold ring (silver is cheaper than gold). A slight tarnish (silver tarnish is a natural occurence) on your silver garnet ring will give the ring a classic and antique look. If your garnet ring has large garnet gems, select a design where the border and corners of the gemstone are protected from side impact. The above information is not expected to turn you into a jewelry or gemstone expert. We hope that you find a reliable jeweller who will give more thought to your longterm benefits rather than worry about his sales revenue. Check out the garnet ring designs mentioned on this page and read the complete details provided for each of them. This will equip you with useful information to recognize a good garnet ring. The contents on this page are the sole property of www.kaisilver.com and www.kaijewels.com, please do not copy this content in any form and force us to take legal action. If you are being legally sued by our legal experts, please do not contact us for mutual settlements or apologies. Our legal team is instructed not to take part in any negotiated settlements.